Hager-Richter Presents at 2016 National Dam Safety Program Technical Seminar - Hager-Richter Geoscience, Inc. : Hager-Richter Geoscience, Inc.
Hager-Richter was invited to participate in the National Dam Safety Program Technical Seminar, “Internal Evaluation Techniques for Earthen Dams,” held February 17-18, 2016 at FEMA’s Emergency Management Institute in Emmitsburg, Maryland. The National Dam Safety Program is a partnership of the states, federal agencies, and other stakeholders that encourages individual and community responsibility for dam safety. 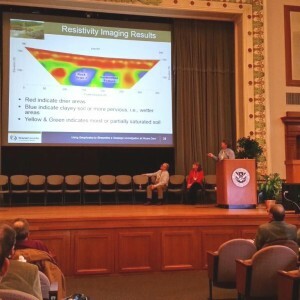 This technical training seminar focused on the state of the practice in geophysical and remote-sensing techniques for evaluating the internal condition of earthen dams. Jeffrey Reid, P.G., Vice President and Senior Geophysicist, was a co-presenter of a case study, “Using Geophysics to Streamline a Seepage Investigation at Moore Dam” with Gill Gregory, Ph.D., P.E., of GEI Consultants, Inc., and Jud Donaghy, of TransCanada Hydro Northeast.